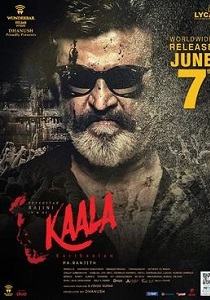 Review Summary: 'Kaala' has Rajni in top form. Entertaining to boot! Kaala Kalikaran is the uncrowned king of Dharavi. His intervention keeps the poor people of the shantytown together. He rules with a twirl of his moustache and a smile that lights up his snowy beard. But the builders try hard to empty the 'dirty' eyesore. Kaala fights for the rights of the people. Is the fight one-sided when te police and the politicians are on the side of the builders? You've seen this all before. Only Rajinikant holds your attention through this tedious movie. It Has SUPERSTAR Rajinikanth Written All Over It!